Harry Potter fans are a passionate bunch. They’re responsible for making J.K. Rowling’s fantastical book series one of the most successful franchises of all time, both in print and on screen. It makes sense, then, that collector’s items associated with the books and movies often have no trouble auctioning for thousands (sometimes millions) of dollars. Here are nine magical pieces of memorabilia whose selling prices would drain the average Gringotts account. If an owl never delivered a Hogwarts acceptance letter to your door, don’t dismay. There are still ways for Muggles to get their hands on one—they just have to be willing to pay a steep price. One of the many prop envelopes that flooded the Dursley home in Harry Potter and the Sorcerer’s Stone (2001) was sold for roughly $6500 in a London auction last September. Unlike many of the letters used in the scene, it had an actual wax seal from Hogwarts (most were just printed on). One lucky bidder won this famously hard-to-capture item at an auction in 2012 [PDF]. Instead of busting out their Quidditch skills, they ponied up $7000 for the Sorcerer’s Stone prop. Unfortunately, the real-life item used in the film is not made from solid gold: It's a resin and plastic ball coated in gold paint. It’s no Nimbus 2000, but the broom Harry learned to fly on in the Sorcerer’s Stone was a hot ticket item at auction (the same one with the golden snitch above). The winning bid placed for the prop was $11,500, up 130 percent from the original high estimate of $5000. An "H" scrawled on the handle and the word "Harry" at the base of the broom head distinguish it from other brooms used in the same scene. The Elder Wand is one of the most sought-after objects in the Harry Potter universe. The real-life prop used in the Deathly Hallows films may not have any magical properties, but that didn’t stop it from becoming a desirable item amongst Muggles. The wand sold for $10,100 at a Premiere Props auction in California in 2013, more than doubling initial estimations of its value. Unlike other wands, this particular prop had the distinction of passing hands from two major characters: Voldemort (Ralph Fiennes) and Harry (Daniel Radcliffe). Thanks to Harry Potter, it’s now impossible to see round, wire frame glasses without thinking of the boy wizard. Harry’s glasses are arguably the most iconic wardrobe piece from the films—a status that’s reflected in their selling price. When one of several pairs worn by Daniel Radcliffe in Harry Potter and the Sorcerer’s Stone went up for auction in Los Angeles in 2015, it sold for $20,000. Another pair used in the film was snagged from the set by Radcliffe (he also owns the specs he wore in the last installment). First edition Harry Potter books are incredibly valuable to begin with. Because only 500 UK first edition copies of Harry Potter and the Philosopher’s Stone were printed (300 of which went to libraries), surviving books could earn owners up to $56,000 today. Add in handwritten annotations and illustrations from the author and you’re looking at a book worth six figures. When Rowling’s annotated first edition copy of The Philosopher’s Stone was auctioned off by Sotheby’s in 2013, it sold for $228,000. In the margins the author includes around 20 original drawings and notes on her writing process, including how she came to invent Quidditch. The sale was part of an annotated first editions auction which raised $666,310 for charity. By 2001—just four years after Harry Potter and the Philosopher’s Stone was released—the fantasy series had grown into enough of a global phenomenon for the original cover art to sell for £85,750. Thomas Taylor’s pencil and watercolor illustration of Harry standing in front of the Hogwarts Express was his first professional commission, and the only drawing of his used in the entire series. It was bought by a private American collector when it was auctioned at Sotheby’s London. You won’t recognize this item from the books or movies, but it’s perhaps the most important piece of Harry Potter memorabilia that’s ever been sold: It’s the chair where J.K. Rowling sat while writing the first two books in the series. The piece is part of a set of vintage, mismatched dining room chairs Rowling acquired in 1995, two years before Philosopher’s Stone hit the shelves. According to a letter that was sold with the chair, Rowling chose it as her writing station because it was the comfiest of the bunch. (Still, it apparently wasn't very comfortable: Rowling told the BBC that “My nostalgic side is quite sad to see it go, but my back isn't.") She originally parted with it at a charity auction in 2002 where it sold for $21,000. It was auctioned off again online several years later, then resold for a whopping $394,000 at a rare books auction this past April. In addition to the chair’s historic significance, it bears graffiti written by Rowling that further adds to its value. 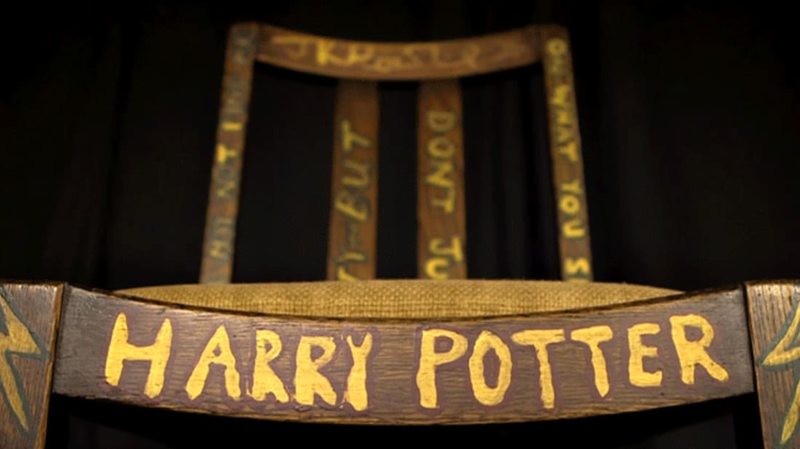 The back reads "O, you may not find me pretty but don't judge on what you see"; "I wrote Harry Potter while sitting on this chair" is scrawled around the seat. The most expensive Harry Potter book isn’t part of the original series. It's one of seven handwritten copies of The Tales of Beedle the Bard, the story-within-a-story featured in The Deathly Hallows. The leather-bound and silver embellished volume contains five fairytales J.K. Rowling inscribed and illustrated herself. It was originally projected to sell for about $100,000, but when it went up for bid at Sotheby’s auction house in 2007, the book earned £1,950,000 (nearly $4 million) for the charity The Children’s Voice. The victorious bidder was the literary giant Amazon.com. After paying more for the book than has ever been spent on any modern literary manuscript, Rowling agreed to let Amazon sell limited-edition replicas on their website (these are still easy to find secondhand).